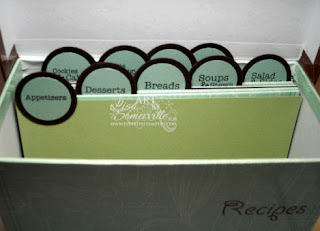 I picked up the Recipe Box and Cards at my local Michaels store - they're located in one of the dollar bins. 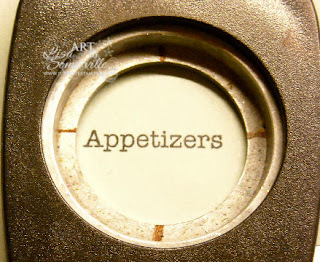 They have a variety to choose from, and with a few add ons using the JustRite Recipe Set and 1-3/16" Stamper, I've created a quick and easy dividers to find my recipes. After stamping my words, I used my 1" Circle Punch to punch them out. 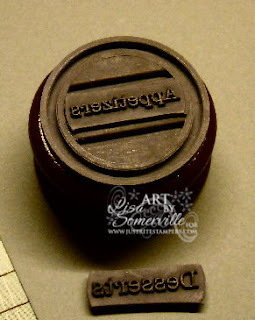 You'll see I have markings on the back of my punch indicating the center both horizontally and vertically, this helps insure when I punch my words are centered within my circle. I adhered these circles to my 1-1/4" punched circle then to the top of my card stock dividers (4" x 6" card stock), they fit perfectly inside my box with the lid closed. Here's one of the recipe cards I created. 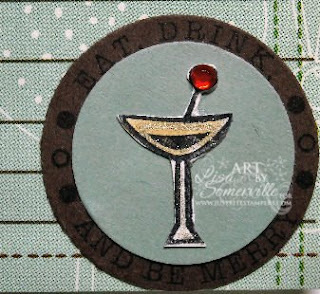 I stamped the Recipe Border in Black on Chocolate Chip card stock, cut with my 1-1/4" Circle punch, adhered a 1" Sage Shadow piece of card stock to the center then stamped and cut out the glass from the DoodleFactory Tropics to go along with my recipe. As always, you can click on the photos for a larger view. This new JustRite set would be perfect for Bridal Showers if you were doing a recipe exchange, or just for yourself to keep your recipes better organized! Great project and thanks for the punch tips! This is a wonderful recipe box and cards, Lisa! 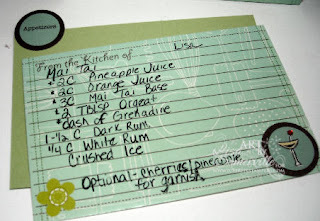 Love your punch how to's!